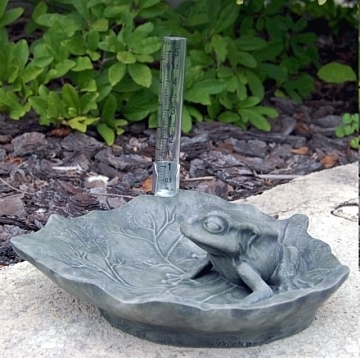 Our garden frog gifts for the yard includes this lotus leaf bird feeder which highlights an interest of a little frog figurine; the feeder also serves as a whimsical rain gauge for the garden. Sculpture is created from fiberglass resin and marble aggregates. Available in several finishes. Dimensions: 4" X 8.5" X 10.5"